This semiprecious stone, is formed as a result of the alteration of copper embedded in silicate materials. Its color usually is from the green to the blue, but we can find varieties ranging from brown to the blackish. The erosion of copper by surface waters rich in silica, give birth to this blue-green stone. 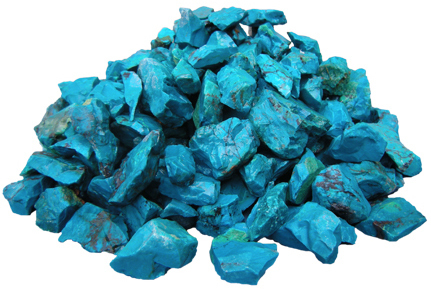 The Incas used it as inlaid in their goldsmith work and they gave a medicinal use, because the chrysocolla calmed their emotions to strengthen their immune system. Color: Blue and blue green. Bright vitreous and fatty, opaque, sometimes faintly translucent. Brightness: Vitreous or matte, opaque. 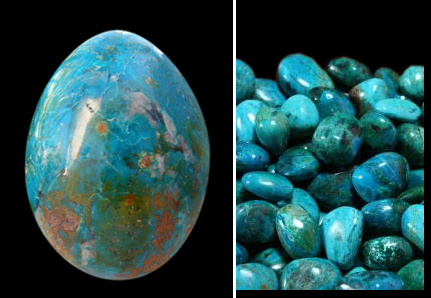 The rough chrysocolla has several applications, such as: bird carving, spheres, cabochons, drums, eggs, hearts and others. It is also used in work of fine jewelry. PERUVIAN MINERALS & JEWELRY S.A.C., offers the services of extraction, production, processing, sale and export of this Peruvian semiprecious stone. You have the opportunity to purchase our 100% Peruvian product.